Is torrenting safe and legal? Whether you live in Mexico, just visiting, or want to access Mexican content from outside of Mexico, a VPN can help. 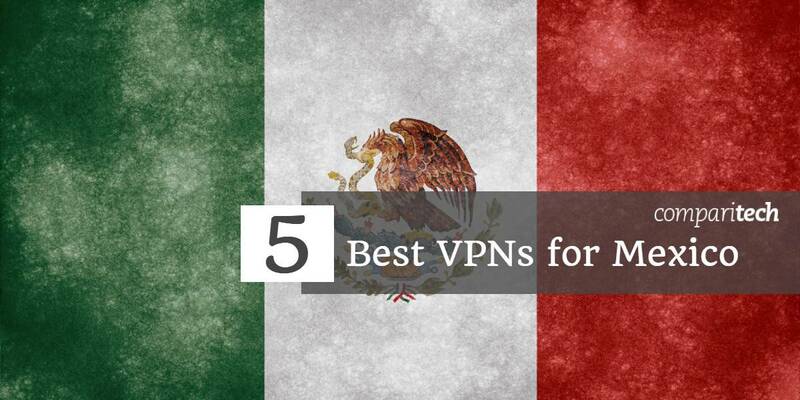 We round up 5 of the best VPNs for Mexico that are great for privacy, security, streaming, and accessing international content. Folks living in Mexico, vacationing in the country, or planning to relocate there in the near future can benefit from a stable Virtual Private Network (VPN) connection. This assists you in keeping internet activity private, torrenting, or unlocking a bevy of geo-restricted streaming media sites such as US Netflix, Hulu, Amazon Prime Video, and more. Additionally, if you are a Mexican citizen and plan to travel outside the country, a VPN can enable you to access everything you want at home, including Netflix Mexico, local channels such as Televisia, Canal 5, and Azteca 7, as well as online banking. If you don’t know what a VPN is, then don’t worry. The software sets up an encrypted tunnel which routes all the internet traffic to and from your device via an intermediary server in a location of your choice. This masks your IP address and makes it appear that you’re in your chosen locale, hence the ability to unblock geo-restricted content. What’s more, the encryption aspect is a nifty feature which makes it almost impossible for hackers or government agencies to snoop on your online behavior. The VPN providers we recommend in this article offer a wide variety of server locations to choose from. This means it’s possible to get an IP address from Mexico even if you’re currently in the US, the UK, Australia, Germany, Canada, India, China, Hong Kong, France, Sweden, Norway, Japan, or anywhere else in the world. ExpressVPN ranks at the top of our recommended list due to its military-grade encryption standards, fast speeds, and an encompassing global network. This provider offers more than 2,000 servers to choose from in 94 countries around the world, including options in Mexico. Its registration in the British Virgin Islands means it isn’t subjected to state-mandated data retention laws. ExpressVPN reliably unblocks a variety of geo-restricted streaming media services, including US Netflix, HBO, Hulu, Amazon Prime Video, BBC iPlayer, ESPN, and more. As mentioned earlier, this provider is known for its blazing fast speeds. An additional perk is round the clock support via a live chat option. ExpressVPN uses world-class security standards including 256-bit AES encryption, which is often referred to as ‘military-grade.’ Additional features include an internet kill switch and DNS leak protection, so your information always remains secure within the encrypted tunnel. This provider only stores non-identifying metadata, and IP addresses are not recorded. It offers easy-to-use apps for Android and iOS, as well as a clean desktop version for Windows and MacOS. A single subscription allows for three simultaneous connections. BEST VPN FOR MEXICO: Get 3 months free with ExpressVPN’s annual plan. The deal includes a 30-day no-quibbles money-back guarantee, so you’ll receive a full refund if unsatisfied. Read our review of ExpressVPN. Panama-headquartered NordVPN has carefully engendered a privacy-focused reputation due to a true ‘zero-logs’ policy. The provider runs a network of over 4,900 servers spanning 62 countries, with Mexico hosting 10. Connecting to a server in Mexico or any other part of the world is a hassle-free process. NordVPN is strongly focused towards media streaming and unblocking geo-restricted feeds. It easily unblocks sites such as US Netflix, HBO, Amazon Prime Video, ESPN, Sky, Sling TV, and more. This provider’s customizability is a particularly strong suit. Users can select servers optimized for certain features including streaming HD video, double VPN, and Tor over VPN. The desktop version includes a primer on how to find the best servers to use for specific tasks, such as unblocking Netflix. NordVPN does not store any user data – this is the zero-logs policy we referred to earlier in the mini-review, so we don’t foresee any concerns on the privacy front. Security standards are similarly robust – NordVPN uses 256-bit encryption, the OpenVPN protocol, an internet kill switch, and DNS leak protection. Apps are available for Android, iOS, Windows, and MacOS. A basic plan allows for six devices to connect concurrently. BEST BUDGET VPN: Save 66% on NordVPN’s two-year deal. This works out to be just $3.99/month for one of the best VPNs around. Read our review of NordVPN. Romania-headquartered CyberGhost has made a concerted effort to improve its quality of service after it was acquired by Crossrider, an Israeli firm registered in the UK, in the latter half of 2017. CyberGhost offers almost 3,000 servers in 60 countries. Mexico, unfortunately, is not included, but there are other options in Latin America such as Brazil. CyberGhost’s app can help you pick a server to unblock specific services such as US Netflix, BBC iPlayer, and Amazon Prime Video. Just select Unblock Streaming mode on the main screen and choose your platform. This provider offers 256-bit encryption, perfect forward secrecy, an internet kill switch, and DNS leak protection by way of security features. These are top-notch protocols so no worries on this front. CyberGhost’s registration in Romania means it is not required by law to store any user data. It spruces this up with an internal policy of not logging any IP addresses or other user data that points to specific web activity. Additional security features include an ad blocker, anti-malware defense, and anti-tracking. You can access the service on Android, iOS, Windows, or MacOS. At the moment, a single subscription allows for seven devices to connect at the same time. GOOD VALUE: Save over 70% on CyberGhost . It’s fast, great value, works with popular streaming services and takes you r privacy seriously. IPVanish scores points on privacy, speed, and top-notch customer support. This provider currently offers over 1,000 servers spread across 60 countries including five in Mexico. IPVanish is headquartered in the US, which may be a cause for concern among privacy-focused users. But it’s one of the few VPN companies that choose to operate its entire network of servers independently, rather than renting or outsourcing. This means it has complete control over the traffic flowing through its servers. An additional layer of security is the fact that IPVanish doesn’t log any personally identifiable information, so it has nothing to share in the first place. IPVanish is a known favorite with torrenters and Kodi users because it enables them to download the Android APK directly to their device. The interface is remote control-friendly for Kodi devices that lack a keyboard and mouse. It works with several streaming media sites such as BBC iPlayer. Military-grade encryption protocols are par for the course. IPVanish secures all connections with 256-bit encryption, perfect forward secrecy, DNS leak protection, and an internet kill switch. This provider allows users to connect 10 devices simultaneously under one plan. That’s the most generous allocation among recommended VPN providers on this list. Apps are available for Android, iOS, Windows, and MacOS, and there’s 24/7 live chat for customer support in case of any problems. EXCLUSIVE DEAL: Comparitech readers can save up to 60% on IPVanish plans. Read our full review of IPVanish. Sweden-headquartered PrivateVPN consistently displays fast, robust speeds and an ability to unblock geo-restricted content with ease. It might be a new entrant to the VPN space but don’t let that fool you into thinking its service is sub-par. PrivateVPN’s server network is relatively minuscule, with a little over 80 servers in 56 locations. However, Mexico is included so that’s a positive sign for anyone who wants to acquire a Mexican IP address while abroad. This VPN is definitely worth the money you’re paying for – it refrains from logging user data, includes support for torrenting, and offers unlimited bandwidth for HD video streams. Some of the streaming services it manages to access are Netflix, BBC iPlayer, Hulu, HBO, and Amazon Prime Video. PrivateVPN is so confident about its core product that it’s currently offering a 30-day money-back guarantee on all packages. Strong security and privacy features are included. Users can choose between 128 and 256-bit encryption and the service provides perfect forward secrecy, an internet kill switch, and DNS leak protection. A basic plan allows for six devices to connect simultaneously. PrivateVPN offers apps for Windows, MacOS, iOS, and Android. LIMITED TIME OFFER: Save over 70% on PrivateVPN and get 5 months extra free. Read our review of PrivateVPN. Should I use a free VPN for Mexico? In your search for a suitable provider, it’s likely that you will stumble across free VPN services. They’re heavily advertised across the internet and come with tempting offers, such as the ability to sign up without a credit card. But that’s usually where the allure ends. Free VPN providers have a sordid history of trying to monetize their service via invasive advertisements, malware, or unethical data mining. At the very least you will experience interruptions in service as they try to upgrade you to a paid service. We’re not aware of any free VPNs that offer the same user experience as the top-rated providers mentioned on this list. Hence, you will likely face weak encryption standards, bandwidth throttling, and a limited choice of servers. Plus, free VPNs typically don’t make the cut for data-intensive tasks like streaming video and playing online games. Why should I use a VPN in Mexico? The organization adds that 2017 witnessed high levels of violence against journalists and an accompanying crackdown on internet freedoms. Online publications suffered cyber attacks and two reporters lost their lives. Dozens more received intimidating messages and death threats. Citizens used digital mediums to register their protests but authorities responded with even further online manipulation. There have also been cases of online trolls, ostensibly acting on behalf of the government, specifically targeting journalists, activists, human rights defenders, academics, or groups whose opinions have been critical of the establishment. Bots have been used to manipulate online debates and social media is rampant with voices that rally against government-directed dissent. In light of these circumstances, it’s clear that navigating the web in Mexico is becoming more of an everyday challenge. The use of a VPN will obfuscate your identity and protect you online. If you’re a journalist, whistleblower, or blogger in Mexico, a VPN can help you spread your message while keeping you safe and secure on the internet. For more information read our comprehensive guide to blogging safely. Torrenting also sits in a legal grey area in Mexico. Technically, there aren’t any laws that govern the issue but government inconsistencies mean that persecution for the act is also possible. To maintain online privacy and anonymity we recommend that you use a VPN to browse the internet in Mexico. DISCLAIMER: Comparitech does not encourage using a VPN to stream or download content illegally. Please consult local laws before if you’re uncertain and always refer to a lawyer for expert advice. Related: Is Torrenting Safe? Is it Illegal? Are you Likely to be Caught? Whether you’re living in Mexico or simply visiting for a few days, the use of a VPN will greatly enhance your internet experience. The first order of business is to decide on a provider that appeals to you. The mini-reviews provide a high-level overview of the service but reading the detailed reviews at the end will give you more insight. After you’ve settled on a provider that works for you, simply sign up with your credit card information. You should receive an email with login information directly from the VPN provider. Use it to connect to a VPN server of your choice. Once a connection has been successfully established, it should be indicated by a green icon at the top of your smartphone screen. You are now armed with a VPN and all web activity is private. If you log into your Netflix account with a Mexican IP address, you’ll be automatically redirected to the local library. This holds true even if the account was originally registered from another country, such as the US or Canada. The quickest and most efficient way to regain access to a Netflix library from a different country is to use a VPN first. For example, if you want to access US Netflix, connect to a US VPN server. Netflix has been actively blocking VPNs due to copyright restrictions since the past several months. As such, not all VPNs are compatible with the streaming media giant. We’ve highlighted the ones that are in our mini-reviews, but you can always check with customer support to be on the safe side. Using a VPN to acquire a Mexican IP address is useful for the thousands of citizens who live outside the country and may wish to keep in touch with local content from back home. A wide range of programs are available in Mexico, including news, entertainment, and sports. Some of the popular channels are Televisia, Canal 5, Azteca 7, and Azteca Uno. Some offer live streaming online but require you to have a Mexican IP address to gain access. That’s where a VPN comes in. Banking and financial institutions won’t ordinarily geo-restrict their services but will monitor incoming requests in order to quell fraud. Accessing Mexican banking accounts from abroad could raise red flags and your request could be stymied. Usually, it’s a safe bet to use a VPN to make it appear you’re actually in Mexico. This will also help avoid answering additional security questions or talking to a customer support representative. 7 Should I use a free VPN for Mexico? 8 Why should I use a VPN in Mexico? © 2019 Comparitech Limited. All rights reserved.